In the early days when road construction uncovered evidence of ancient civilizations, archaeologists rushed to the site and worked diligently to save as many artifacts as they could before construction began. In 1937, a provision in Nebraska's Standard Specifications for Highway Construction, which is still active today, required contractors to suspend operations when historical or genealogical articles are discovered. Before 1937, contractors worked cooperatively with district engineers to preserve newly discovered archeological sites during road construction. In 1959, legislation authorized the Nebraska Department of Roads (NDOR) to enter into agreements with state agencies to remove and preserve archeological materials discovered during highway construction and to use highway funds for this purpose. Largo Canyon Highway Salvage project, February 1955. Negative: LA 2949#33 [Laboratory of Anthropology/Museum of New Mexico photo archives]. With the founding of the Highway Archaeology Program in New Mexico in 1954, the need to hurry up and get out of the way ended and a working relationship was formed among highway officials and archaeologists. The National Historic Preservation Act of 1966 led to the establishment of the National Register of Historic Places, The Advisory Council on Historic Preservation, as well as State Historic Preservation offices and review boards, furthering the support of the Highway Archaeology program. The program, also called salvage archaeology and born from the need to preserve artifacts uncovered during construction, is supported by the Federal Highway Administration, State Departments of Transportations and museums. 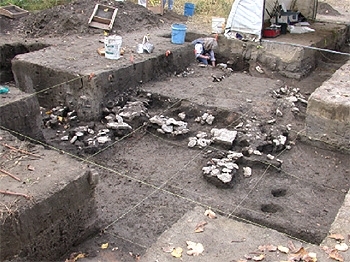 Archaeology is an important part of the environmental program. 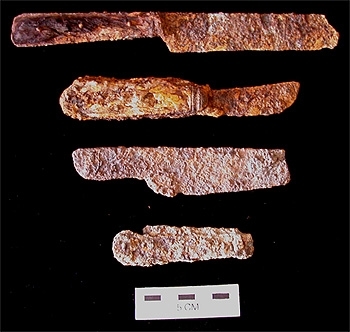 Knives from floor of cabin at Engineer Cantonment, 1819-1820. It is not uncommon to see archaeologists working along the road, inspecting and recording newly discovered prehistoric treasures, and many states have put their Highway Archaeology artifacts on their Web sites. Nebraska's Department of Roads (NDOR) hosts the Web site entitled Nebraska's Cooperative Archeological and Paleontological Salvage Program, its roadside archaeology revealing ancient histories of camels, large herds of elephants and other prehistoric animals roaming areas that would become Nebraska roads. Within the last ten years, the Nebraska Highway Archaeology Program has evaluated more than 1,000 highway improvements proposals and discovered more than 200 previously unrecorded archaeological sites. Fireplace in center of log cabin at Engineer Cantonment, 1819-1820. 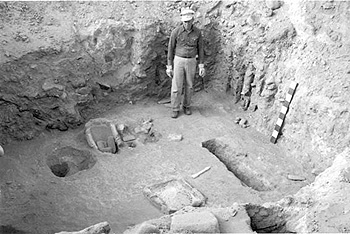 New Mexico's Web site, Roads to the Past, funded by the New Mexico Department of Transportation, is a place to learn about an AD 1250-1325 Plains pit house, or in more recent history, see the items left behind in 1540 by General Francisco Vazquez de Coronado's army. Their Traveling Exhibitions Program, know as TREX, cites that more than 10,000 years of New Mexico prehistory and history have been "unearthed and documented." The University of Iowa Office of the State Archaeologist Highway Archaeology Program Internet site hosts a wealth of historic and prehistoric information. In the last decade, they have evaluated more than 2,800 archaeological sites and 800 buildings or farmsteads and have redesigned some roadway projects to make historical property eligible for the National Register of Historic Places. The Illinois Department of Transportation has funded an archaeological program since passage of the 1956 Federal-Aid Highway Act that allowed highway construction dollars to be used in salvaging archaeological sites. Their Administrative Memorandum No. 45 was issued in June 1956 establishing a policy for the preservation of artifacts found in proposed highway rights-of-way. Many other state and local agencies have adopted highway archaeological and salvage programs, working together to preserve the ancient pasts of the land that is now home to our Nation's highways.